At the end of the Ming dynasty (1368–1644) and beginning of the Qing dynasty (1644–1911), four painters with the surname Wang became highly influential throughout the community of traditional Chinese artists. Associated with one another via educational or familial connections, these artists are known to historians as the Four Wangs. They followed Dong Qichang’s (1555–1636) dichotomy of Southern and Northern Masters (Nanbei Zong, 南北宗), which venerated the literati styles of the South and stressed the imitation of ancient and classical styles and techniques. Of the four, Wang Shimin (1592–1680) studied the method of Huang Gongwang (1269–1354) and resulted in his own rigorous techniques and an elegant style. Meanwhile, Wang Jian (1609–1677) researched the Four Yuan Masters and traced certain artistic styles back to Dong Yuan (act. tenth c.) and Juran (act. tenth c.); he excelled at both ink monochrome and polychrome ink and color paintings. 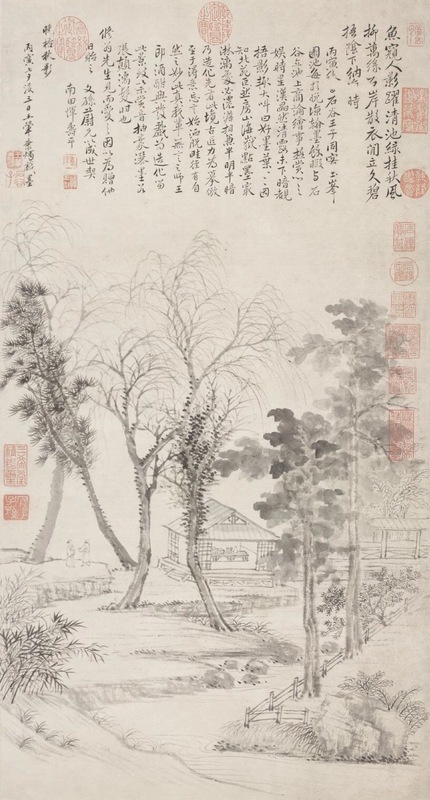 Transcending various schools of ancient styles to form his own, Wang Hui (1632–1717) combined elements from works by masters of the South and the North and infused his paintings with intense observations of nature. Finally, Wang Yuanqi (1642–1715) was a master of texture shading and is known for his vigorous brushwork and contemplative compositions. Wang Yuanqi developed what became known as the Loudong school with adherents such as Wang Yu (1714–1748) and Huang Ding (1660–1730). At the same time, Wang Hui led the formation of the Yushan school with successors including Yang Jin (1644–1728) and Gu Fang (act. Qing dynasty). 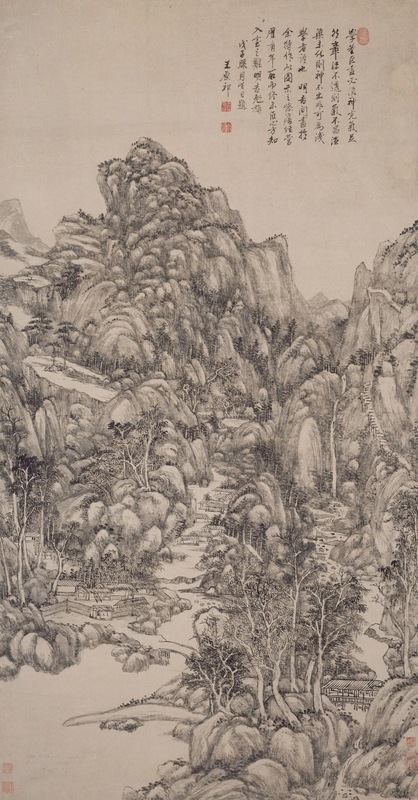 During the Qing dynasty, the Four Wangs were recognized as orthodox (i.e., authentic) landscape painters—in contrast to the individualist painters such as the Four Monks—and their work was imitated by both court painters and commoners. Their work continues to influence Chinese artists. The exhibition is divided into three main sections, namely, Section I: Foundations; Section II: Paintings; and Section III: Schools. Displaying the art of these painters, the exhibition highlights how they developed their art by studying ancient and classical works and infused their work with inspiration from the natural world. Their continuance of traditional forms combined with a willingness to innovate resulted in a complete transformation of Chinese painting. This reappraisal of their paintings and the history of Qing-dynasty landscape paintings provides insight into the cultural value of “modeling after the classical”. This exhibition is through October 30, 2018. The Palace Museum is closed on Mondays. The Palace Museum is located at the heart of Beijing, directly behind the Tiananmen. 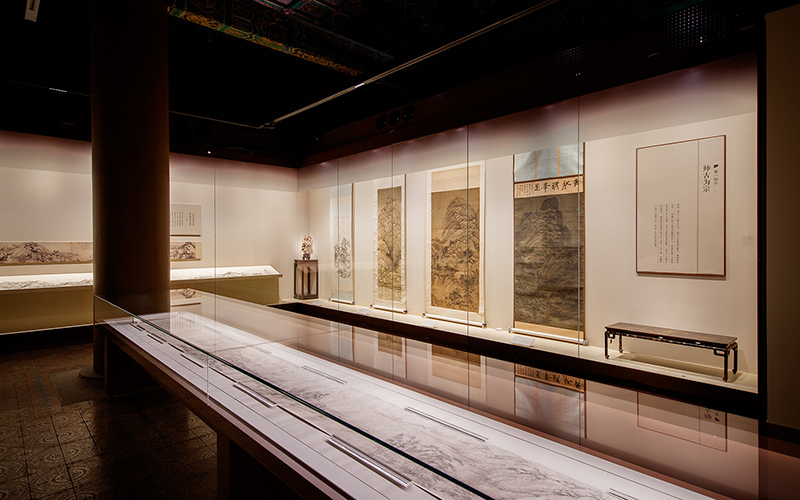 The exhibition is inside the Hall of Literary Brilliance (Wenhua Dian, 文華殿).